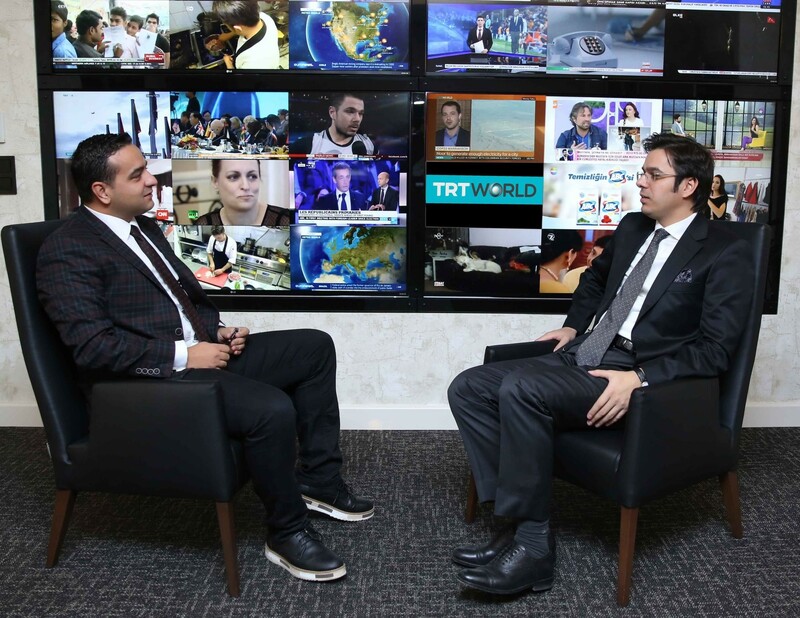 Last week Turkey's public broadcaster Turkish Radio and Television Corporation (TRT) officially launched its first English-language channel TRT World in a bid to reach out to an international audience. Daily Sabah sat with TRT Deputy Director General İbrahim Eren, who is in charge of TRT World, and talked about the present and future of the channel. Eren explained that the challenges they faced at the beginning of the channel's formation were mostly bureaucratic, however, he underlined that they did not face significant problems while signing contracts with journalists abroad. TRT World Ceo İbrahim Eren (R) during the interview with Daily Sabah's Ali Ünal. Underlining that they put humanitarian understanding at the core of their news channel, Eren also added that at TRT World they do not discuss the effects of any event on the great powers or international institutions; instead they discuss the effects of these events on the local people. Elaborating on their editorial policies Eren said that they are a balanced news channel and a public broadcaster while he stressed that no one expects them to have a pro-Turkey stance in all matters. "We will tell the truth, even though it is inconvenient or disturbing," Eren also added. Providing information about their future plans, Eren said that the most important aim in their five-year plan was to be among the top three international news channels which broadcast in Europe, the Middle East and in near Asia. How was TRT World formed and what was the reasons that led to its establishment? It was formed in order to cater to Turkey's certain needs that emerged as a result of the country's increased activity in the international community since 2002. The decision was made in 2010 by the TRT board; no progress had been made until Jan. 2014. Once we started in January. 2014, we were able to commence to test broadcasting in less than one and a half years. We can say the news channel fills a very particular gap in the international media. There are several renowned international news channels such as the CNN, BBC and Al-Jazeera. CNN is U.S.-centric, while the BBC can be deemed Euro-centric, or U.K.-centric to be more specific, and Al-Jazeera is no longer the voice of the voiceless as it was before. The issue is that Turkey has a different take on the political developments across the world when compared to the said news channels; the Turkish one is a synthesis of all these approaches and, thus, more holistic. This is one of the reasons why TRT World was needed. On the other hand, Turkey also has a unique position between the West and the East. While certain countries to the west of Turkey are struggling with economic and political instabilities, there is a war going on outside Turkey's borders on the east. Between these two, Turkey is a relatively prosperous and a peaceful country. For instance, this proximity to the war in Syria allows us to cover it in a more different and effective way, as we have a certain kind of awareness about it. What kind of challenges have you had to face during the formation of the news channel? Turkish Radio and Television TRT already had certain issues. As you know, TRT is a public broadcaster and the people working in this institution are civil servants. Therefore, it has a bureaucratic characteristic with a rigid structure. What our challenge was to establish an international news channel which would broadcast in English and would be able to compete with news channels like the BBC, CNN and Al-Jazeera. This was a significant challenge. Furthermore, since we formed the news channel, we have gone through two general elections and a presidential election. Election periods always mean hard times for public broadcasters all over the world. The challenges we faced at the beginning of the channel's formation were mostly bureaucratic. However, we did not face significant challenges while signing contracts with journalists abroad, as we agreed with a major international headhunter company. They provided us with a list of prospects which we shortlisted and then interviewed. There were many people previously working for the BBC or Al-Jazeera whom we were able to strike a deal with. I have to say that one advantage we had was Istanbul; when these people came to Istanbul and saw our studios in the Ulus district, they did not hesitate to sign a contract with us. Istanbul has a significant brand value. On the other hand, many unfortunate events took place after they began to work with us. When they first came to Turkey, the reconciliation process was still going on; however, simultaneously, the PKK and Daesh were realizing terrorist attacks within Turkey. As a result of this, Turkey commenced anti-terror operations both within and out of Turkey, which concerned our foreign colleagues a bit. The bomb attacks in Ankara and Istanbul, especially with the Istanbul Atatürk Airport attack, had a significant impact on how Turkey was viewed by expats. Nevertheless, more than 200 journalists originating from 36 countries started working with us while all of these were taking place. Still, after the July 15 coup attempt, around 35 of our personnel resigned due to security concerns. The remaining foreign personnel, however, started to express their admiration of the Turkish people, as they have never witness such a stalwart resistance of people against a coup. How did you form your editorial policies? Were they modeled after another institution's editorial policies? While there are around 15 international news channels that broadcast in English, we only perceive the several most renowned ones as our competitors. Firstly, we gathered a team of consultants who had previously worked at the aforementioned channels. Then, we examined the structures of these larger news channels' structures, while determining which of these channels' structure would fit us, taking culture and means into consideration. Means were important as we did not have an unlimited budget; we cannot match Al-Jazeera's, or even Russia Today's budgets. To elaborate, our news channel's budget is lower than some of the other channels which operate under the TRT. We focused on forming a news channel with a limited budget which could be sustainable and as effective as the said news channels. During the formation of the channel, one of the first things we did to sign a contract with the brand consultant BrandAge was to give Serdar Öztürk, who has been working with Turkish Airlines, full control over the visuals. We held a meeting with eight international companies, eventually agreeing with the DixonBaxi Agency for the design of our logo and certain visuals. Still, we have briefed them about what we want. While Turkey had improving and declining relations with countries like Russia and the U.S., the humanitarian and human dignity aspects were always the invariants of the Turkish foreign policy. These aspects are embedded in our people and our state. This is why I believe Turkey can never be good in realpolitik. Nevertheless, we put this humanitarian understanding at the core of our news channel. We do not discuss the effects of any event on the great powers or international institutions; we discuss the effects of these events on the local populace in countries like Afghanistan, Syria and Iraq. Hence the refugee crisis means much more for TRT World. "Where statistics become people" is our motto. For instance, when a tsunami happens, we do not just talk about the numbers; we try to explore how the people are affected in a very concrete way and touch on subjects like how many years it will take for this specific country to recover from this disaster. This does not mean that we are not interested in politics. As you know, politics is about the people, like all the concepts we, as the people, use. Moreover, while we are aware of the tragedies, we do not want to be a somber news channel. We are hopeful about the future and we want to spread this hope to our audience. Our target audience is the global citizens who speak English. Moreover, we are targeting a relatively younger audience than the CNN and BBC; while both of the said channels target the 50 plus age group, we target 40 plus. We want our audience to be socially influential, which means they use social media effectively, are informed and are sensitive towards humanitarian crises. We believe there is an audience just like we described that also includes Muslims in the Western countries. Especially the second and third generations who feel themselves like Europeans or Americans, while retaining their Islamic identities. You have mentioned some of the effects of the July 15 coup attempt on your channel. Did the coup attempt also affect your editorial policy or will it affect it? While our editorial policies did not change, our tone has changed a bit. Before the coup attempt, we had a softer tone about the developments in general; now, we can say that it has become a littler harsher in terms of wording. As journalists, you cannot relay everything you observe, as some of the events may be too much for the audience. After the coup attempt, we understood that even if the audience might be disturbed, we have to stay faithful to what has transpired. As we were just the storytellers of events before the coup, we actually became a part of events that occurred during the night of the coup. Moreover, the international press has significantly played down or toned down the reality of the coup attempt, a subject to which many of our expats agree, we felt the obligation to tell what really happened in Turkey and what the consequences were. Now, this is also true for all our news coverage in other countries as well. We will tell the truth, even though it is inconvenient or disturbing. More than a year has passed since the channel was founded. How do you evaluate your current status? Let me correct this, we have made the channel accessible via TÜRKSAT on Oct. 29, 2015. However, this did not mean that the channel was opened on this date, as we were not broadcasting 24/7. It was actually a test broadcast. Even today we do not cover news for the entire span of 24 hours. We will start broadcasting internationally in Jan. 2017. 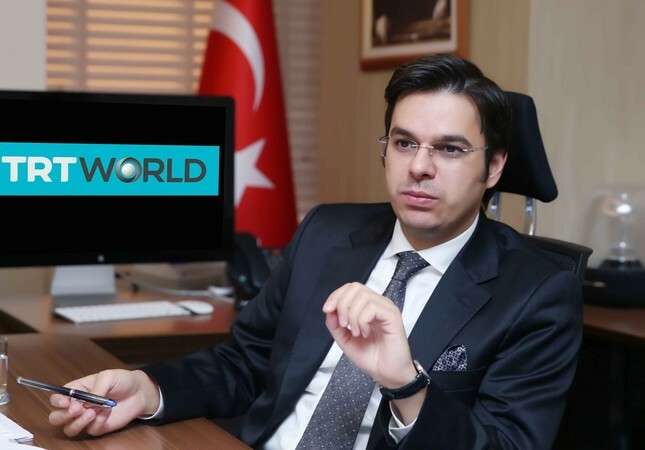 While now TRT World can only be watched through the internet and TÜRKSAT, in a two-year period, the channel will be accessible from every part of the world. Therefore, this process will continue until mid-2018. In this sense, the channel is still in the making. We have different plans which cover three-year and five-year periods. Our first goal was to make our channel known to the people, as brand establishment is a long-term process. Even though we seem to perceive Al-Jazeera and Russia Today as newly established channels, they are over 10 years old. TRT World is around one years old. Still, I believe we have done much and are on the right track. Moreover, we are working with 70 percent of our capacity in terms of employees. We will be recruiting people in the days ahead. On the other hand, we are working on opening broadcast centers in London, Washington, D.C. and Singapore, in order to cover the U.S., Europe and Asia. As Asia is rising in terms of economy and is an important market, we preferred to open a studio in Singapore. As you know, Singapore is also one of the crucial hubs of the world market. Our broadcast centers in Washington, D.C. and London will be larger. We will be broadcasting from these centers for four hours each, while broadcasting for 12 hours from Istanbul. This will be our daily breakdown. Will TRT World have a pro-Turkey stance in all matters? Could you elaborate on your editorial policies? We are a balanced news channel and a public broadcaster. Public broadcaster means that we are not a state-run news channel. As you know, during the opening ceremony of the TRT World, President Recep Tayyip Erdoğan stated that he is not expecting this channel to be the official bulletin of the state. To answer your question, we will be pro-Turkish as much as the BBC is pro-British. Where do you see the channel in five years? Moreover, what are your criteria for success? Our criteria for success are to be an internationally influential news channel and to make our audience aware. We have a motto, "Where news inspires change." We do not want a unilateral relation; we have to interact with the audience and inspire change in their opinions. Therefore, we are aiming to become increasingly apparent in the international media. Ad revenues and ratings are not much of importance for us; we desire the socially influential people to watch our channel. This is how a news channel's audience is. The most important aim in our five-year plan is to be among the top three international news channels which broadcast in Europe, the Middle East and in near Asia. Our goals in the U.S. are more digitally oriented, rather than TV. We will emphasize on digital broadcasting in the U.S. We have a separate team of experienced digital broadcasters who have previously worked for Al-Jazeera and other renowned broadcasters. I believe they will be successful in achieving our goals in a relatively short period of time. On the other hand, we have a team of news reporters. Instead of permanent correspondents located in various countries, we will have most of them in Istanbul and deploy them wherever and whenever it is necessary. We emphasize on the quality of the news, rather than the quantity. TV is no longer the source of acquiring breaking news; people only watch TV to have an in-depth insight of news they are interested in or when an event on a national scale is taking place. In this sense, we will focus on investigative journalism based on quality. What are the most significant criticisms or praises you have heard about your editorial policies? We are receiving positive feedback from other news networks. This can be understood from the number of applications we have received for our open positions. It has not declined even after July 15. Our professionalism, the agencies we work with, and as such are effective in this. This indicates that we are on the right path. Moreover, there were people who came to us with the bias that freedom of press in Turkey is being threatened. Yet, they ended up criticizing the freedom of press in Turkey less and praising TRT World instead. On the other hand, there were instances of slander towards our channel. They claimed that they have interviewed certain people, who remain anonymous, from afar and wrote baseless news about channel. Nevertheless, prestigious publications like the Monocle have praised us. We have a positive image in the international media. We are not being regarded as the mouth piece of the government. This is due to our team of quality news reporters, which actually prevents even the possibility of such a thing. We have to be the voice of the voiceless, not the state, as President Erdoğan has stated.